After yesterday's historic rout in the market, there were signs of stabilization in overnight trading with most markets trading higher, with the key catalyst a report from MNI that the Fed may end its rate hikes as soon as this coming spring. US stocks were set to open sharply firmer after two days of losses that wiped out the S&P500’s gains for the year and left the tech-heavy Nasdaq index teetering on the brink of falling into the red. Losses were concentrated in the technology sector, as investors dumped their holdings of FAANG shares and pushed the Nasdaq index to seven-month lows and energy shares too had dropped in line with a 6 percent oil price slump S&P 500. That fed through to Asia on Wednesday, taking MSCI’s index of ex-Japan Asia-Pacific shares almost half a percent lower, but it clawed most of the losses to trade flat, with MSCI’s all-country benchmark was flat too, attempting to snap two days of falls. Chinese stocks closed in the green and near session highs, rebounding from Tuesday's drop as Asia closed mixed, but it was Europe that showed the most promise with the Stoxx600 solidly in the green, led by Italy where BTPs rallied from the open, after a report that Deputy PM Salvini may be open to budget revisions; Salvini then denied the report, clarifying that he’s only open to tweaks and won’t compromise on the main issues. Italians bond yields fell up to 16 basis points initially, putting 10-year yields on track for their biggest daily drop in almost a month but the market gave up some of its gains after the denials. Sentiment was then dented again, and the EUR snapped lower after Ansa reported that the European Union has rejected Italy’s 2019 budget - as expected - and that the Excessive Deficit Procedure would be warranted on Italy. Still, despite the expected escalation in the standoff between Italy and Europe, the Estoxx and DAX pushed higher but were off best levels with banks and telecoms leading gains as Italy's FTSE MIB outperformed peers with local banks +1.5%. However, it was a report from wire service MNI just after 6am that caught the market's attention, when Market News International reported that the Federal Reserve is starting to consider at least a pause to its gradual monetary tightening and could end its cycle of interest rate hikes as early as the spring, citing senior people at the Fed they didn’t identify. While a Dec. rate hike is all but assured, the debate will become more lively beginning at the central bank’s March meeting and certainly by June, MNI says. The paradox, of course, is that according to the Fed's own dot plot there will be at least 3 hikes in 2019, so for one or more Fed presidents to engage in such an ECB-esque trial balloon of defiance of Chairman Powell must mean that the disagreements within the FOMC over the future of monetary policy are truly boiling over. ... and slammed the Bloomberg dollar index back to session lows. US Treasuries and the Eurodollar strip also pared losses and faded Wednesday’s bear steepening after the MNI report; that said, Fed rate hike expectations are steady on Wednesday morning with December 2018 pricing in 19bps, and the next 25bps increase expected in March 2019. The U.S. 10Y TSY yield is 1bp to 3.07% with December T-Note futures -20 ticks to 119-04+; U.S. 2/10s +1bp to 26bps; U.S. 5/30s steady at 43bps. Today's modest gains immediately sparked positive commentary: "We view the sell-off as overdone and a bull-market correction, with valuations that have become more compelling,” Jason Draho, head of asset allocation, Americas, at UBS Global Wealth Management wrote in a note. "We recently increased our overweight to global equities on the view that the markets are already pricing in growth and trade risks." Still, while the Fed trial balloon helped preserve upside momentum in risk assets, investor sentiment remains susceptible to minute to minute volatility that’s rocked markets since October as traders have to contend with President Trump tape bomb unpredictability and demands for lower rates as corporate credit spreads at two-year highs reflect investor angst about borrowing costs. In FX, the euro got an early boost and Italian bonds rallied after the abovementioned La Stampa report that Italy’s Deputy Prime Minister Matteo Salvini may be open to budget revisions; it trimmed gains after his League party denied the report, and as the EU was said see Rome’s budget at serious non-compliance risk. The pound was little changed against the dollar, after earlier rising on the back of broader weakness in the greenback; Britain’s budget deficit widened in October as spending rose at the fastest pace in 11 years. Australian dollar rebounds from a one-week low hit very early in Asia as a recovery in oil prices combined with exporter demand to trigger short-covering ahead of U.S. Thanksgiving holiday. Asian stocks mostly weakened as the global stock rout continued into the region following the losses in US, where the DJIA dropped over 500 points to turn negative YTD and in which energy names were pressured as oil slumped nearly 7%. ASX 200 (-0.5%) and Nikkei 225 (-0.3%) were led lower by spill-over selling seen across the commodity-related sectors, while Wesfarmers shares plummeted nearly 30% after the spin-off of its Coles unit which had its stock market debut today. Hang Seng (+0.5%) and Shanghai Comp. (+0.2%) opened with firm losses but then rebounded off their lows with price action choppy amid ongoing trade uncertainty and after criticism from USTR Lighthizer’s report that China has not altered its unfair practices and appears to have conducted further unreasonable actions in recent months. Finally, 10yr JGBs failed to benefit from the widespread risk averse tone with price action subdued amid a lack of BoJ presence in the bond market and after the weakness in T-notes as US investors closed positions heading in to Thanksgiving. 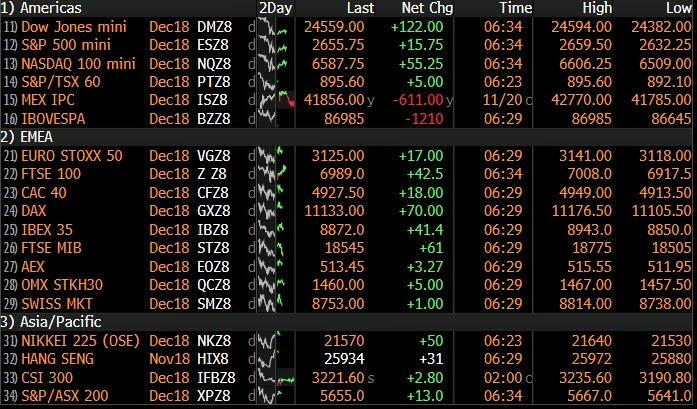 European equities are higher across the board (Eurostoxx 50 +0.8%) as the region stemmed the stock rout seen in Asia and Wall Street. Italy’s FTSE MIB (+0.6%) was initially outperforming with Italian banks higher amid initial reports from Italian press that Deputy PM Salvini could potentially be open to budget revisions, which were later dismissed by League sources ahead of the budget ultimately being rejected. In terms of sectors, financial names lost the top spot to telecom names, who are outperforming after French telecoms jumped following comments from Orange (+1.7%) CEO which renewed M&A gossip. Elsewhere, Indivior (-13.6%) fell to the foot of the Stoxx600 (+0.4%) after the Co. lost a US court ruling that had prevented Dr. Reddy’s from selling a generic version of a treatment for opioid addiction. In FX, the DXY index has maintained its recovery momentum into the midweek session, but is off best levels amidst a welcome reprieve in riskier assets and broad sentiment ahead of Thanksgiving. The DXY has drifted back from another uptick towards 97.000, though remains underpinned ahead of 96.500 and recent lows. The Greenback also retains an underlying bid as G10 and EM counterparts struggle to recoup losses beyond round number/psychological/technical resistance against the backdrop of heavy option expiries at strikes within close proximity to prevailing prices (and with major fundamental issues still prescient of course). EUR/CAD - The single currency is holding up relatively well given more toing and froing on the Italian budget, but ultimately ongoing recalcitrant stance from Rome after reports about potential revisions were renounced in advance of the EU’s official rejection and potential if not probable EDP implementation (scheduled release time 11.00GMT, but appears to have been preannounced). However, 1.1400 is proving almost as obstinate and a decent 1 bn option expiry could well be keeping the headline pair in check. Meanwhile, the Loonie is off worst levels after sliding through 1.3300 and could be gleaning some encouragement from a partial recovery in oil prices in the run up to Canadian wholesale trade data. GBP/CHF/JPY - All bucking the overall trend, albeit barely in terms of the Pound and Franc, as Cable pivots 1.2800 and Eur/Gbp straddles 0.8900 on Parliament approval aspirations as UK PM May heads to Brussels for more discussions on the Brexit draft and the coup to oust her seems to have fizzled out. Meanwhile, Usd/Chf has only tentatively bounced from near 0.9900 lows within a 0.9935-55 range vs Usd/Jpy back on the 113.00 handle vs a base around 112.30 at one stage on Tuesday when risk-off flows were rife, but bidding interest prevented further downside. Note, a raft of option expiries could be key into the NY cut, stretching from 111.90-112.00 to 114.00 and totalling some 11 bn. EM - Rand in focus for several reasons, as Usd/Zar hovers near 14.0000 ahead of Thursday’s SARP policy meeting and following softer than expected SA inflation data, with a decent 1.1+ bn options expiring between 13.9000-14.0000 along with speculation about more strike action. In commodities, WTI (+1.6%) and Brent (+1.4%) took a breather from yesterday’s selloff, where prices fell almost 7% with the decline attributed to supply concerns, negative risk sentiment and Trump’s protective approach to Saudi relations. Prices are underpinned by the latest API inventory data which printed a surprise drawdown in headline crude stockpiles. Traders will be keeping an eye on today’s DoE release for any hints of increased US shale production. Today will also see the release of the EIA natural gas storage data, which has been rescheduled due to the US Thanksgiving Holiday. Elsewhere, the metals complex is in positive territory with gold (+0.2%), silver (+0.7%) and copper (+0.5%) all supported by the pullback in the USD. Goldman Sachs said slump in oil reflects over supply concerns for 2019 and that technical position factors have exacerbated the volatility, while it also cited low liquidity heading into Thanksgiving as well as broader selling in commodities and cross-assets amid rising growth concerns. In terms of the day ahead, we’re due to get a first look at October durable and capital goods orders data along with the latest weekly initial jobless claims data, October leading index, October existing home sales and final November University of Michigan consumer sentiment survey revisions. Away from that, Italy’s Finance Minister Tria is due face questions in the Lower House and as highlighted earlier, today is the day that the European Commission is due to publish opinions on the budget plans of Euro Area countries, including possibly Italy. I suspect they’ll be a lot of market participants in the US relieved that they only have to make it through today to get to Thanksgiving. I suspect they’ll also be a lot of market participants outside of the US relieved that the US market won’t be open tomorrow and we’ll have a circuit breaker for now and a chance to take stock after a very difficult few days. The sell-off baton has been passed from asset class to asset class of late and yesterday it was oil’s turn to pick it back up again with Brent and WTI crude shedding -6.69% and -6.84% respectively taking losses close to -30% in only around 7 weeks from its 4-year highs. A remarkable run. These moves dominated price action across other markets, with the energy sector (-3.29%) leading US equity declines and inflation breakevens trending lower. US 10-year TIPS-implied breakeven inflation rates are now down to 1.98%, taking their year-to-date change into negative territory for the first time. Somewhat worryingly, there are signs that the oil drop is a negative demand story, rather than a positive supply shock. Oil-importing countries, who would theoretically see an improvement in their terms-of-trade, did not see their currencies gain, e.g. the Turkish Lira the worst performer of the day, falling -1.37%. There didn’t appear to be one particular event which triggered the oil move although our commodity strategy team did note that recent commentary is foreshadowing possible disappointments at the OPEC meeting on December 6th. They believe that Libya and Russia are unlikely to support a renewed push from Saudi Arabia for discipline and therefore fear an underwhelming meeting outcome. Anyway that weakness for oil did spread to the US HY energy sector which widened +13bps, meaning it is now 169bps wide of the October and YTD tights. As for equities, well the NASDAQ closed down -1.70% but was as much as -2.81% lower at one stage, while the S&P 500 and DOW closed down -1.82% and -2.21% respectively – both marginally off their lows. The NYSE FANG index also recovered to finish -1.55% from its intraday low of -4.48%, though Apple did fall another -4.78% meaning it’s now -23.74 % off the October peaks and therefore in the definition of a bear market amid concerns over demand for products. That move is also equivalent to a loss of value of $265bn, or roughly the annual GDP of Bangladesh a country with 165 million people. Meanwhile, the VIX touched 23.81 intraday yesterday (highest since October 31st) before closing at 22.48. Apart from the oil sector, which led losses, consumer discretionary also fell -2.18% after profit outlooks for the likes of Target (-10.53%), TJX (-4.39%) and Kohl’s (-9.24%) all disappointed ahead of the busy holiday shopping period. Back to credit, cash spreads for Euro IG and HY finished +4bps and +13bps wider yesterday while in the US, spreads outperformed a bit but were still +2bps and +7bps wider respectively. It’s worth noting that this is now the eighth day in a row that Euro HY spreads have widened, for a cumulative move of +72bps. In fairness, spreads moved wider eight days in a row back in September, but the total size of that widening was a rather mild +17bps. In May, they actually widened for 10 days in a row when BTP yields were soaring, however the size of that move was +59bps so the current run really stands out. In fact, the biggest eight-day move in recent years came during January 2016, when spreads blew out +79bps amid similar conditions to today: plummeting oil prices. Considering the sizeable risk-off that we’re seeing at the moment we’re hardly witnessing the flock to safe haven assets that one might expect. Treasury yields were only down -0.7bps yesterday while Bunds rallied -2.2bps and the USD index gained +0.67%. Gold and the Japanese yen both actually sold off -0.17% and -0.14%, respectively, and both have traded in a fairly benign +/-3% range for November to date. This morning in Asia, sentiment continues to be remain negative but markets have rallied off the opening lows where the likes of the Nikkei began trading down around -1.5%. As we type this has recovered to -0.32%. Elsewhere the same pattern has emerged with the Hang Seng (-0.10%), Shanghai Comp (-0.13%) and Kospi (-0.51%) all down but off their session lows. Oil has bounced a bit from yesterday and is up +1.75% as we go to print. S&P 500 futures (+0.37%) are also pointing towards a slight improvement in market mood. Sentiment remains nervous though and not helped by the overnight release of a report on China from the US Trade Representative Robert Lighthizer’s office which accuses China of continuing a state-backed campaign of intellectual property and technology theft. The report said, “China fundamentally has not altered its acts, policies, and practices related to technology transfer, intellectual property, and innovation, and indeed appears to have taken further unreasonable actions in recent months.” This ramp up in rhetoric just 10 days ahead of the upcoming G20 meeting overshadowed earlier comments from the White House economic advisor Larry Kudlow about President Trump injecting “a note of optimism” into trade talks with China. Back to more selling off markets from yesterday now. BTP yields spiked to an intraday high of 3.714% yesterday (+12bps) and the highest since last month before paring much of that to finish at 3.617%. That wild ride for BTPs comes prior to the European Commission today opining on the budget plans of the Euro Area nations. For Italy, under EU fiscal rules the European Commission had three weeks to issue an opinion on Italy from November 13th – when Italy left unchanged its 2019 draft budget plan. The suggestion however is that the Commission will opine on Italy at the same time as other Euro Area nations so we’re likely to hear today. Assuming the Commission pushes ahead with launching an EDP, the process involves the Commission informing the Eurogroup first. The next meeting of the Eurogroup is December 3rd so it’s possible that the process gets aggressively accelerated to meet that deadline. Our economists have previously highlighted that the decision to launch an EDP remains a political one – the Commission proposes the action but the Eurogroup has the option to overrule. However, it could be difficult to reverse the decision of the Commission. The Eurogroup votes on a double majority of countries representing 65% of the population (the country under procedure does not vote). As long as Germany and France support an EDP, the remaining countries do not have enough weight in the qualified majority vote to overturn the decision. Anyway expect the BTP market to be focused on this today. The Brexit front was relatively quiet again, though the DUP did abstain again on a procedural vote on the UK budget, forcing the Conservatives to accept several amendments from Labour in order to secure enough votes. The DUP are effectively on strike until they get things more their way on the Irish border thus making the running of government very challenging. Separately, BoE Governor Carney and Chief Economist Haldane testified to Parliament’s Treasury Committee and said they welcome the negotiated Withdrawal Agreement. Haldane noted that uncertainty may be weighing on business investment and could negatively impact fourth quarter economic growth, while Carney said that the risk of a no-deal Brexit outcome is “uncomfortably high.” The BoE policymakers plan to send new Brexit analysis to the Committee next week on November 29. Elsewhere, UK PM May is all set to travel to meet the EC President Juncker this evening in an effort to make progress on an outline of the future trade deal the two sides want to strike. She is likely to ask for further concessions from the EU given the backlash she is facing at home from euroskeptic Tories. However, it seems unlikely that the EU will give further headroom to the UK PM ahead of the upcoming Sunday summit where the two are expected to sign off on the 585-page exit agreement as well as the future partnership paper. On the data front yesterday, US housing starts and building permits mostly met expectations. New starts came in at 1.23 million, up 1.5% mom but down over the last 12 months, while building permits were at 1.126 million, down -0.6% mom and also down over the last year. In Europe, French unemployment stayed at 9.1%, marginally better than consensus expectations which had called for a rate of 9.2%. German PPI inflation printed at 3.3% yoy as expected. In terms of the day ahead, this morning we’ll get October public finances data in the UK along with the OECD’s latest economic forecasts. Across the pond this afternoon we’re due to get a first look at October durable and capital goods orders data along with the latest weekly initial jobless claims data, October leading index, October existing home sales and final November University of Michigan consumer sentiment survey revisions. Away from that, Italy’s Finance Minister Tria is due face questions in the Lower House and as highlighted earlier, today is the day that the European Commission is due to publish opinions on the budget plans of Euro Area countries, including possibly Italy.